As Barack Obama begins his final year in office, the goal of reducing the budget deficit, which the public once ranked among the most pressing objectives for his administration, has continued its recent decline in perceived importance. Overall, 56% say that reducing the budget deficit should be a top priority for the president and Congress in 2016, down from 64% who said this last year. The emphasis given to the budget deficit peaked in 2013, the first year of Obama’s second term, when 72% called it a top priority. At that time, the deficit ranked behind only improving the job situation and the economy on the public’s to-do list. Today, reducing the budget deficit ranks ninth in priority out of 18 policy areas tested in the survey. The latest national survey by Pew Research Center, conducted Jan. 7-14 among 2,009 adults, finds that strengthening the nation’s economy and defending the country from future terrorist attacks rank atop the public’s priority list: 75% each say these should be top priorities for the country. These also were the public’s two most important policy goals in 2015. While still at the top of the list, the share citing the economy as a top priority has declined over the past several years (from a peak of 87% in 2011) as views of the nation’s economy have improved. The number citing jobs as a top policy priority also has fallen, from 84% who said this in 2011 to 64% today. The survey finds substantial partisan gaps over a number of policy priorities. Some of the biggest differences are over the importance of dealing with gun policy – 57% of Democrats view this as a top priority compared with just 13% of Republicans – and climate change (55% of Democrats vs. 14% of Republicans). 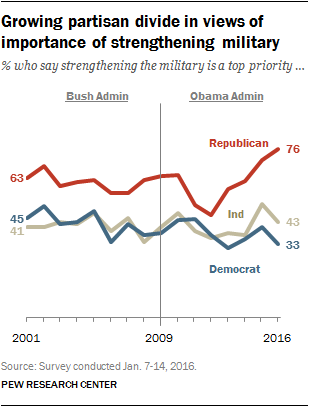 By contrast, fully 76% of Republicans rate strengthening the military as a top priority, compared with just 33% of Democrats. Republicans and Democrats also are at odds over the importance of reforming the criminal justice system, an issue that recently has received attention from lawmakers in both parties. Nearly half of Democrats (49%) view reforming the justice system as a top priority, compared with 32% of Republicans. Overall, this ranks as a lower-tier priority for the public (44% top priority). 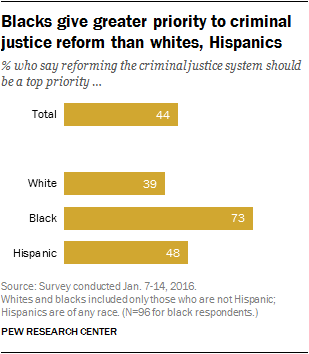 Blacks are far more likely to view revamping the criminal justice system as a key goal than are whites and Hispanics. Nearly three-quarters of blacks (73%) say this should be a top priority, compared with 48% of Hispanics and just 39% of whites. The importance of reducing the budget deficit has lost ground among members of both parties, though Republicans continue to rate this as a higher priority than Democrats. Since 2013, Republicans have become 14 percentage points less likely to say reducing the deficit should be a top priority, while there has been a 19-point decline among Democrats and a 17-point decline among independents. Republicans (70%) remain much more likely than independents (54%) or Democrats (48%) to say deficit reduction is a top priority, as they have been since 2012. 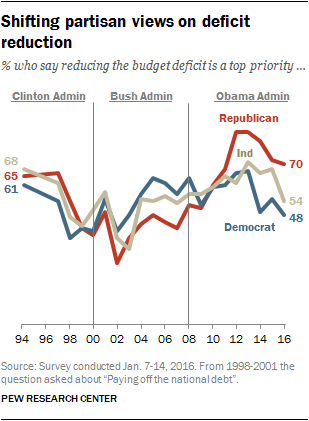 During the Bush administration, Republicans tended to give less priority to reducing the budget deficit than did Democrats. 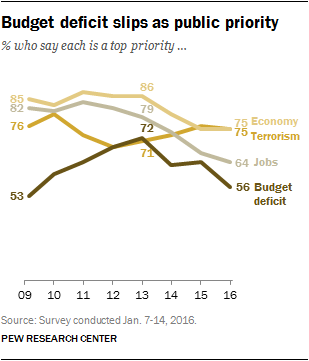 In 2007, for instance, Republicans were 15 percentage points less likely than Democrats to say that reducing the budget deficit should be a top priority for the president and Congress (42% vs. 57%). With a year to go in Obama’s presidency, the president’s job ratings continue to be very stable: 46% approve of how Obama is handling his job as president, while about as many (48%) say they disapprove. There has been little movement in Obama’s job ratings since shortly after he won reelection. Obama is rated lower than Bill Clinton was at the start of his final year in office (56% approved), but higher than George W. Bush was at a similar point in his presidency (31% approved). Ronald Reagan began his final year in office with 50% saying they approved of his performance (slightly higher than Obama’s current rating); Reagan’s ratings surged over the course of 1988 into the low 60s. 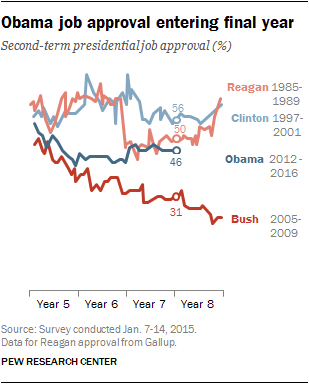 (For more, see “Presidential Job Ratings from Ike to Obama”). 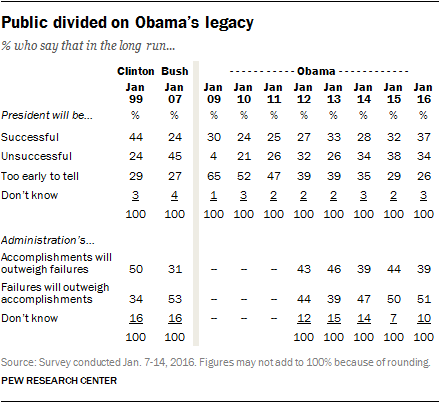 When it comes to Obama’s long-term legacy, the public offers a mixed assessment. About as many say they think he will be a successful (37%) as unsuccessful (34%) president in the long run, while 26% say it is too early to tell. When asked a different question without an explicit option to say it is too early to tell, more say they think the Obama administration’s failures will outweigh its accomplishments (51%) than say accomplishments will outweigh failures (39%). Strengthening the nation’s economy (75%) and defending the country from future terrorist attacks (75%) stand at the top of the public’s priority list for the president and Congress in 2016. A tier below these top issues, about two-thirds call improving the educational system (66%) and improving the job situation (64%) top priorities for the country. The public now ranks reducing the budget deficit (56% top priority) toward the middle of its list, alongside issues such as reducing crime (58%) and dealing with the problems of poor and needy people (54%). Fewer than half say reforming the criminal justice system should be a top priority (44%). Even fewer cite dealing with global climate change (38%) or dealing with gun policy (37%) as top priorities for the country. Only about three-in-ten (31%) say dealing with global trade issues should be a top priority, the lowest rating given to any of the items included in the survey. As the unemployment rate has continued to fall since 2013, the share citing the job situation and economy as top priorities has fallen significantly. In the wake of Barack Obama’s reelection in January 2013, fully 86% said strengthening the economy should be a top priority and 79% said the same about improving the job situation. While the economy is still atop the public’s priority list and jobs remain a top concern, the share calling each a top priority in the current survey is down 11 points and 15 points, respectively, since three years ago. While the priority given to certain economic issues has waned, the salience of other issues has increased. In 2014, 40% called dealing with the issue of immigration a top priority (the item was not included in the 2013 survey); today, 51% say immigration should be a top priority for the country. Three years ago, 28% said dealing with global warming should be a top priority. In the current survey, a larger share (38%) says dealing with global climate change should be a top priority for the president and Congress (the wording of this item was updated in 2015). Over the last three years, there also has been an uptick in the share saying strengthening the U.S. military should be a top priority. In 2013, 41% said a stronger military was a top priority; in 2015, 52% said this. Views on the importance of a stronger military have changed little since last year: 49% call it a top priority in the current survey. As in the past, there are wide differences between Republicans and Democrats in the issues they identify as top priorities for the president and Congress. Very few Republicans say dealing with gun policy (13%) or dealing with global climate change (14%) should be top priorities for the country. By contrast, 57% of Democrats say gun policy should be a top priority, while 55% say the same about global climate change. 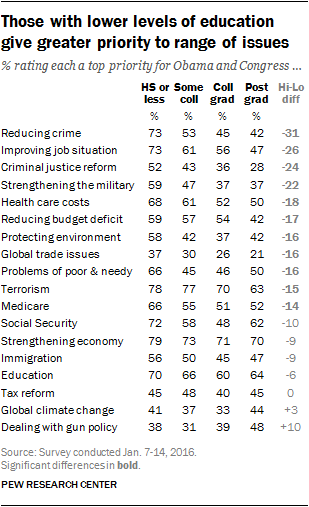 Other issues that Democrats give greater priority than Republicans include protecting the environment (61% vs. 26%), improving the educational system (76% vs. 47%), dealing with the problems of poor and needy people (63% vs. 34%), reforming the criminal justice system (49% vs. 32%) and improving the job situation (68% vs. 53%). Republicans and Democrats are about equally likely to say strengthening the economy, securing Social Security, reducing health care costs and reducing crime should be top priorities for the country. Republicans are much more likely than Democrats to say strengthening the U.S. military should be a top policy priority (76% vs. 33%). Republicans also are 23 points more likely than Democrats to say dealing with the issue of immigration should be given top priority (66% vs. 43%). There is a comparably large gap on the emphasis given to reducing the budget deficit: 70% of Republicans say this is a top priority compared with 48% of Democrats. When the rank order of priorities for Republicans and Democrats are shown side-by-side, there are some areas of agreement, but also clear differences. 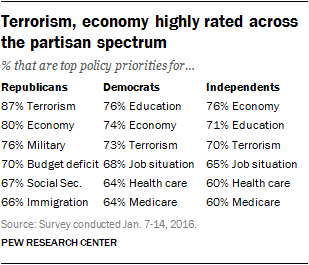 For Republicans, defending the country from future terrorist attacks ranks highest, with 87% calling this a top priority. Strengthening the economy (80%) and military (76%) rank second and third, respectively. Seven-in-ten Republicans (70%) say reducing the budget deficit should be a top priority, while 67% say the same for taking steps to make the Social Security system financially sound and 66% say this about dealing with the issue of immigration. Improving the educational system (76%), strengthening the economy (74%) and defending the country from future terrorist attacks (73%) top Democrats’ priority list. About seven-in-ten Democrats (68%) call improving the job situation a top priority; 64% say reducing health care costs and taking steps to make the Medicare system financially sound should be top priorities. Over the past several years, the partisan divide over the importance of strengthening the U.S. military has grown significantly. Republicans have historically been more likely than Democrats to say strengthening the military should be a top priority. In January 2014, 61% of Republicans said strengthening the military should be a top priority compared with 36% of Democrats – a 25-point gap in opinion. Since 2014, Republicans have become 15 points more likely to prioritize strengthening the military. Views among Democrats edged higher in 2015, but have fallen back to about where they were in 2014 (36% said it was top priority in 2014, compared with 33% in the current survey). As a result, Republicans are now 43 points more likely than Democrats to say strengthening the U.S. military should be a top priority for the president and Congress – the widest partisan gap in opinion over the fifteen year history of this question. Older adults are more likely than younger adults to prioritize a range of issues including social security, the military and Medicare. Fully 82% of those 65 and older say securing the Social Security system should be a top priority, as do 75% of those 50-64; by comparison, 54% of those 30-49 and just 41% of those under 30 say this is a top priority. A similar pattern is seen on the issue of securing Medicare, with those 50 and older significantly more likely than those under 50 to call this a top priority. When it comes to strengthening the military, just 28% of those 18-29 say this should be a top priority for the president and Congress compared with 47% of those 30-49, 54% of those 50-64 and 68% of those 65 and older. The youngest adults also lag behind on the priority they give to addressing the issue of immigration: 38% of those under 30 call this a top priority compared with about half or more of adults 30 and older. Education is the one issue that those under 50 prioritize more than the oldest adults: 72% of those 18-29 and those 30-49 say improving the educational system should be a top priority for the country compared with 64% of those 50-64 and 53% of those 65 and older. Those with the lowest levels of education are more likely than those with higher levels to say a wide range of issues should be top priorities for the president and Congress. Among those with no more than a high school diploma, 73% say that reducing crime should be a top priority, compared with 53% of those with some college experience, 45% of college graduates and 42% of postgraduates. A similar pattern is seen when it comes to improving the job situation: 73% of those with no more than a high school diploma give this issue top priority; the share saying this should be a top priority falls to 47% among those with a postgraduate degree. Those with no college experience are more likely than those with a college degree to say several other issues should be top priorities, including strengthening the military, reducing health care costs and dealing with the problems of the poor and needy. The public is divided over how much President Obama will be able to accomplish during the final year of his presidency. About half of Americans (51%) say Obama will accomplish a great deal or some of what he would like to over the next year; 46% say that he will be able to accomplish little or nothing. These views have changed since November 2014, in a survey conducted following the Republicans’ sweeping midterm election victory. At that time, 39% said that Obama would be able to accomplish at least some of his goals over the remaining two years of his presidency. Democrats – especially liberal Democrats –think Obama can still accomplish something over the next year. Fully 76% of liberal Democrats say Obama can achieve a great deal or some of what he wants to accomplish, up from just 52% who said this in the aftermath of the 2014 election. A somewhat smaller majority of conservative and moderate Democrats (60%) think Obama will be able to accomplish at least some of what he wants to do, up seven points from November 2014. About half of independents (49%) expect Obama to get a great deal or something done, up from 36% in November 2014. But Republicans’ views have not changed much. Just 33% see Obama accomplishing much over the coming year; 28% said this after the GOP’s big election victory. Overall views of Obama’s legacy – like his job approval ratings – fall roughly between those of George W. Bush’s and Bill Clinton’s. About as many say, in the long run, Obama will be a successful president (37%) as say he will be unsuccessful (34%), while 26% think it is too early to tell. In the long run, more (51%) think that the Obama administration’s failures will outweigh its accomplishments than say its accomplishments will outweigh its failures (39%). At an earlier point in Bush’s second term (January 2007), far more thought he would be unsuccessful (45%) than successful (24%). By contrast, in January 1999, more thought Clinton would be successful (44%) than unsuccessful (24%). The same pattern is evident in views of the past three administration’s accomplishments. Views of the Clinton administration’s accomplishments are most positive, views of Bush’s are most negative, while opinions about the Obama administration’s accomplishments fall in between. In general, Democrats view Obama’s legacy in similar terms as they saw Clinton’s in 1999. 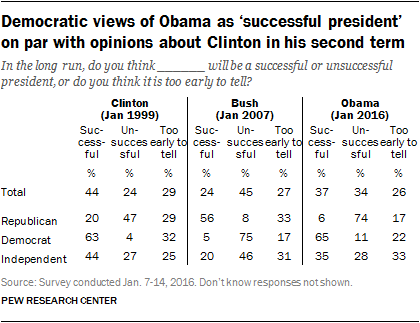 Nearly two-thirds (65%) say Obama will be a successful president; 63% said the same about Clinton in January 1999. And about as many Democrats (74%) say the accomplishments of his administration will outweigh its failures as said this about the Clinton administration 17 years ago (69%). But Republicans are much more critical of Obama’s legacy today than they were of Clinton’s then. And in their assessments of whether Obama’s accomplishments will surpass his failures, Republicans express even more negative views today than Democrats did about Bush in 2007. Nearly three-quarters (74%) of Republicans say Obama will be an unsuccessful president. By comparison, 47% of Republicans viewed Clinton as unsuccessful in 1999. Democratic views of Bush in 2007 were about as critical of GOP opinions of Obama today; at that time, 75% of Democrats said Bush would be an unsuccessful president. 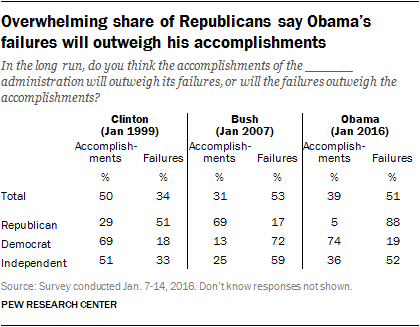 Fully 88% of Republicans say the failures of the Obama administration will outweigh its accomplishments. That is 37 points higher than the share of Republicans who in 1999 said that Clinton’s failures would outweigh its accomplishments (51%). And it is 16 points higher than the share of Democrats who said that about Bush in 2007 (72%).